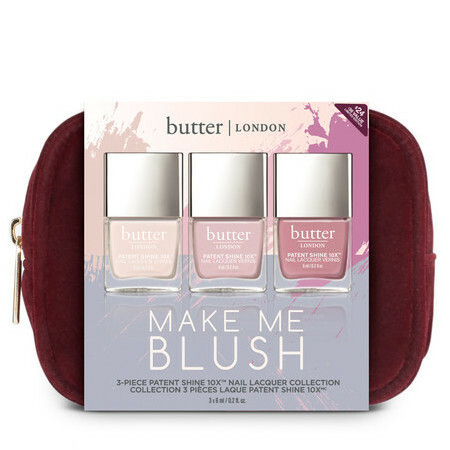 Butter London Make Me Blush is a 3-Piece Patent Shine 10X Nail Lacquer Set containing limited edition, travel-size shades that are chip-resistant, quick-drying and give nails a high-gloss, gel-like cushion finish. Made in the USA. Gluten-free. Cruelty-free & Vegan. This 8-Free formula contains no Formaldehyde, Formaldehyde Resin, DBP, Toluene, Camphor, Ethyl Tosylamide, Xylene nor TPHP. Butyl Acetate, Ethyl Acetate, Nitrocellulose, Isopropyl Alcohol, Tosylamide/Epoxy Resin, Acetyl Tributyl Citrate, Stearalkonium Hectorite, Benzophenone-1, Styrene/Acrylates Copolymer, Malic Acid, Citric Acid, Bambusa Vulgaris (Bamboo) Extract, Ethyl Trimethylbenzoyl Phenylphosphinate, Diamond Powder, Polymethylsilsesquioxane, Colophonium (Rosin), CI 77891 (Titanium Dioxide), CI 15850 (Red 7 Lake), CI 77007 (Ultramarines). Apply one coat of nail polish. Let dry. Apply a second coat. Let dry. For best results, apply a basecoat prior to polish and a topcoat when polish is dry. 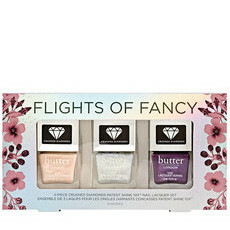 Like other reviewers, I was also very disappointed with these nail polishes. 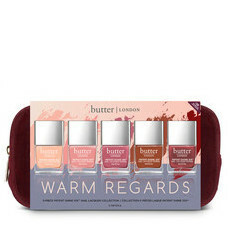 They apply really badly, very streaky and uneven finish, even when applying multiple coats. I love the colors in the pack but they take some time to dry.